We at Maxi Health Research® have created an enhanced combination of certified organic mushrooms including reishi, maitake, shitake, turkey tail, fuling, and caterpillar mushrooms. 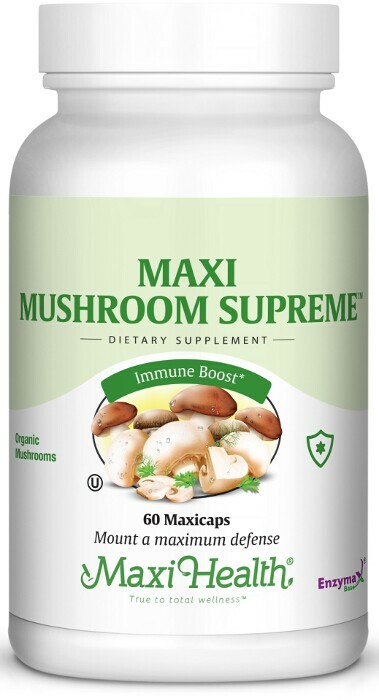 When you think of mushroom supplements, think Maxi Health and Maxi Mushroom Supreme™. Take two (2) to four (4) Maxicaps™ daily or as directed. Other Ingredients: Vegetable cellulose, Enzymax® (calcium carbonate, bromelain, papain, lipase, amylase, protease, silica), magnesium stearate. This product contains no animal products, soy, wheat, yeast, gluten, salt, sugar, milk, artificial flavors, colorings or preservatives. Shi-Gen® ,Cordy-Gen® & Rei-Gen® are registered trademarks of Gourmet Mushrooms® Inc.